Shore Duty Three is a 3BR/2BA condo, approximately 2700 square feet. 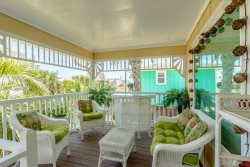 It is located just one block off the Gulf of Mexico and is the perfect size for a family retreat or gathering of friends. The downstairs is large enough to sleep six people, with plenty of room to spread out. There are tile floors in main traffic areas and carpet in bedrooms. The master bedroom has a king bed with a full private bathroom. The other two rooms have queen size beds and share a bathroom in the hallway. All bedroom come equipped with TVs and DVD players. The living room offers a 55” big screen TV, DVD player and leather furniture with room to wind down after a fun-filled day at the beach. In the high-ceiling kitchen you'll find a large Gulf view window with an island that seats six, and a large open dining area with seating for eight. The private balcony facing The Gulf of Mexico is perfect for morning coffee and picturesque sunsets by evening. Don’t forget about the pool located just downstairs to lounge around all day. If grilling is something you enjoy, feel free to throw on some steaks or burgers while you're down at the pool relaxing. If you have any rainy days during your stay, enjoy shopping, entertainment and great seafood restaurants, all just minutes away. If you are looking for an affordable upscale beach getaway, this unit is a real value! Book today and enjoy some special family memories and get ready to relax...You are now on SHORE DUTY! NOTE: There is a second upstairs floor with two separate loft areas which can sleep an additional 8. There is also a full bath. (THIS AREA IS NOT INCLUDED) If you would like this additional space, the loft area can be rented as Shore Duty Five Unit 205.